“Russia has set a new standard of reacting to [Georgian – South Ossetian] circumstances, in full accordance with international law,” Lavrov told students of the Moscow State International Relations Institute. “For a start, it would be a right step to place an embargo on weapons exports to Georgia until it is run as a normal country. We are interested in closely cooperating with the OSCE and the UN in order to guarantee security in South Ossetia and Abkhazia, as stated in the six principles signed by Presdent Medvedev and President Sarkozy”. To read Lavrov's full address to students follow the link. Russia’s FM also promised that Russia will continue to take measures to punish those guilty and to guarantee that the Georgian regime will never do any more harm. Lavrov vowed that Russia wouldn’t get involved in confrontation in the international arena as its relations with NATO are now entering the ‘moment of truth’ stage. He also spoke on Russia’s relations with Germany and the U.S., with whom Russia will build relations ‘only on a mutually honest basis’. “Russian-German reconciliation [after World War II] is one of the most important factors in building a new Europe. 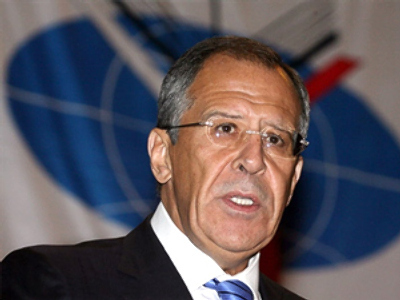 We will not allow anyone to drive a wedge between our two nations,” said Lavrov.